Who knew the Electrolux vacuum could invoke some of the highest emotion on Christmas morning? My in-laws recently bought a small, cordless Electrolux vacuum cleaner. We saw this battery operated, light-weight machine do its thing on Thanksgiving as it cleaned up after four little ones on both carpet and wood. My kids (who love to vacuum and pretend to vacuum behind us) realized they could handle this vacuum. Several times they asked their granddad (papa) if they could help him out. In our house, usually Chad is found with a broom in our kitchen. And with little ones, it seems crumbs just roll off their bodies. So one night at 11 pm I get an idea. What if I buy all three of them the Electrolux vacuum cleaner for Christmas? I mean we had talked about wanting to increase the kids’ responsibilities around the house. This tool could actually enable them to help out practically. Chad and I make it a point to not purchase “household items” for one another for Christmas presents – a bit too impersonal. But this felt more like a joke to me, and a joke that actually accomplished a parenting strategy! The gift would help Chad and steward our kids to learn more responsibility – perfect! So on Christmas morning I pulled out this present. I was giggling inside knowing the gift might be a total disaster. As they opened the gift, Chad realized what it was first and I could tell he liked it. But then the unexpected happened. Our kids erupted in screams of delight and jumped up and down with excitement (video below). I laughed hysterically watching my kids celebrate a vacuum that would eventually lead to a chore. But they are at the age that they actually like to help. Okay, I know that won’t last forever but it sure is nice at this age! But then I started thinking. When we first become Christians, the whole “Christian” way of life seems exciting. Reading our Bible, sharing our faith, giving to others – it sounds fun, rewarding, and we want to give to God who so graciously rescued us. I remember my emotions even as a five year old who had just become a believer. I had just learned to write, but I wanted to do something for God! I started copying the Bible on notebook paper. I remember thinking, “I will re-write the entire Bible and give it to someone who needs Jesus.” It was fun, and then it became hard on my hands, and then I just completely stopped. Suddenly, my celebration that made me want to write the Bible felt like too much work. What if we received the tools to clean up a broken world and shouted like Joeli shouts on the video, “YESSSSSSSS!” with such pleasure that she cannot contain her joy. What do we do with the everyday tools God gives us to join him in his mission? Do we pick them up and feel the weight of their responsibility? Or do we delight that we are equipped to work with God to clean up the world? I laughed hysterically when I saw my kids erupt in applause over a vacuum cleaner. In a couple of weeks, when the “adventure” of the vacuum wears away, will I see delight on their faces as they use the tool to help out around the house? Even if the excited emotions are not there, but if the willingness to serve remains, I will delight deeply – not in hysterical laughter but in a sense of contentment and joy in just knowing we are on a journey together through life. When we as new Christians experience high emotions and our spirits shout that we will do anything for God, I don’t think God laughs hysterically like I did on Christmas morning. But I do think that when He sees us continue to pick up the tools he gives us to serve him and his mission, even if we’re not emotionally charged, I think he too delights deeply. 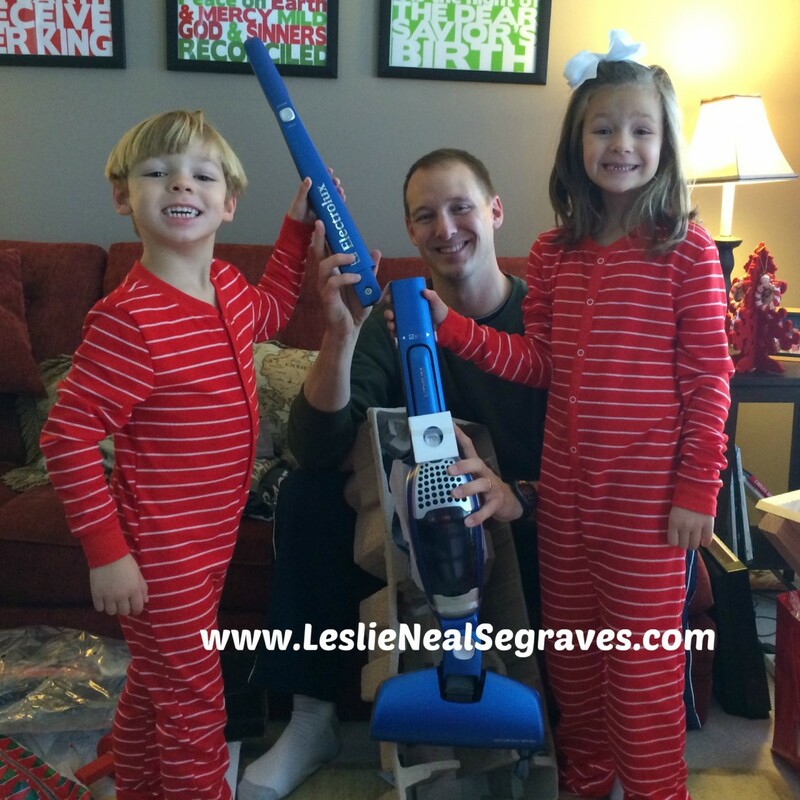 I will never forget the sound of my kids celebrating a vacuum cleaner on Christmas morning. In 2015, I want to engage with him in His mission in the world, bearing the tools to help him clean the world with joy. I love how it made Chad excited for a different reason…and the reference to Tom Sawyer.